Or they will flicker, even when off, if you are using a high tech light switch. Though mostly they just make my eyes hurt and give me headaches. 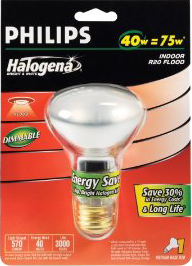 Philips has come out with a line of High Efficiency Incandescent (HEI) light bulbs called Halogena. They work like normal bulbs but produce twice the amount of light for the energy consumed. Making them very close to CF in efficiency. They work great. No hum or flicker while dimmed. The color of the light is white with a slight warmth to it. Overall I think it is a great find. You can buy them at Amazon.com or in stores at Home Depot. The only bummer is that few other companies are doing this. GE stopped their research into this technology in 2008 probably due to the fear that incandescent lights will be banned like what is happening in Europe. I hope that is not our future too. Categories: Green Living and Technology | Tags: carbon footprint, Green Living and Technology, Green Living and Technology, Halogena, HEI, High Efficiency Incandescent | Permalink.